I must confess that I was not familiar with the brand when I was given word that their latest headphones were coming to us for review. They operate in the audiophile circles of the headphone world, but their aim is to keep the cost of their products at the more reasonable end of the spectrum. When I was given these in ear headphones, all I knew was that they were audiophile grade and cost £156. The first thing that struck me when I was handed the box is that it smacked of neither audiophile nor £156. It is a pretty basic box with minimal amounts of styling, made from fairly thin card and a plastic tray inside. It looks remarkably like an early DVD box set or an Amiga game. This is not always a bad thing, however. Regular readers will know that I have mixed feelings about packaging. Sure, I like some swish presentation to give a premium feel as much as the next guy, but at the same time, I do not like the idea that a product has its price bumped by £20 just to get a swanky box that will ultimately be thrown out anyway. In the box, you get a rather nice, rigid carry case that feels very well constructed, with dividers to house the spare tips for the ear buds. There are 2 sets of small, medium and large tips included plus a bonus set of “premium” memory foam tips that honestly feel kinda like chewing gum. The headphones themselves are extremely lightweight and there is good reinforcement at the joints, but I couldn’t help but think that the wires were worryingly thin. Making tech super lightweight is great, but sometimes it can leave products feeling a little flimsy, even if that is not the case. After a few minutes of experimentation, I figured out how to wear the headphones and which one went in which ear – yes, I know how to wear headphones – but the B200’s feature a neat design where the cable loops over your ear thanks to a semi rigid sleeve over the wire so you put them in your ear with the wire pointing up. It takes one or two goes to get the technique down, but it’s not tricky. For me, the premium tips were an absolute winner. They feel weird, but once you squish them and push them into your ears, they are incredibly comfortable and do an excellent job of cancelling out ambient noise. The loop design means that the weight of the cable is not applied directly to the ear bud, so there is not the usual battle of earpiece retention vs gravity. The result it that these headphones stay in place exceptionally well. I was able to enjoy a brisk walk on a windy evening and never once had to push the headphones in to keep the fit nice and snug. Brilliant! As usual, I let the B200’s burn in for a day or two before really testing the sound quality on them. It’s a very natural sound, nicely balanced, which is my personal preference. There is plenty of bass, but it is not an auditory assault like on some sets. Mids and highs are nicely separated with a good amount of crisp detail which gives a satisfying breadth to the sound and again, nothing seems overly forced. The benefit of a neutral sound is that it lends itself well to a wide variety of musical genres and I found that the B200’s handled any track I threw at them in their stride. Listening to podcasts where the focus is on people speaking, the voices do not sound overly bass heavy and resonant which music focused headphones have a tendency to do. These are really nice headphones. 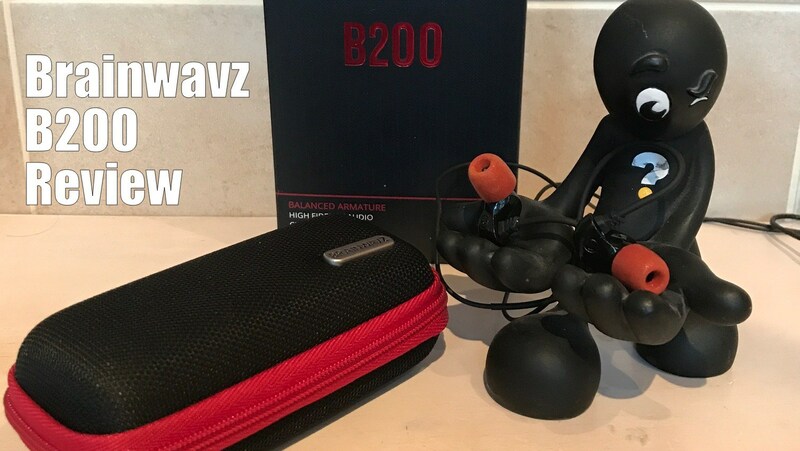 Brainwavz offers a 24month warranty on the B200’s(“should any problem arise due to a defect in workmanship”) which shows a reassuring level of faith in their products and quality control. This is not something to be underestimated. I do maintain some concerns about how fine the cable is on these headphones and I did notice that they do tangle up quite easily because of the loops, but at least if there is a weakness there, Brainwavzshould look after you and that is reassuring. Whilst they are reasonably priced for headphones at this level, £156 is still a significant chunk of money so a little reassurance is a very good thing! If you haven’t heard of Brainwavz, I would certainly you encourage you to check them out. They certainly don’t look as flashy as some of their peers, they may perhaps lack some of the prestige feels, but there is absolutely no escaping the excellent performance or the phenomenal comfort of these headphones. The Brainwavz B200 are for sale on Amazon here for £149.50.